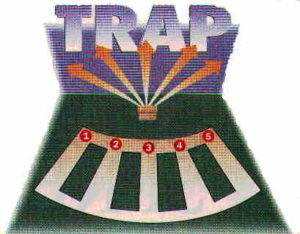 Bartlesville Sportsmen’s Club operates one trap field. Trap uses one machine located in a bunker 16 yds. in front of the shooter. The trick here is that the machine constantly swings back and forth so that when the shooter calls for a bird he/she has no idea in what direction it will emerge. A maximum of 5 shooters can participate with only one firing at a time. Shooting is fast paced and exciting. A round for one person consists of 25 shots, five each from 5 different shooting stations, the object being to score the greatest number of broken targets.